I have a scenic thin moon page here, featuring more ascetically pleasing moon images. This page features the thinnest of the thin, those that are less than 24 hours from new. Success! 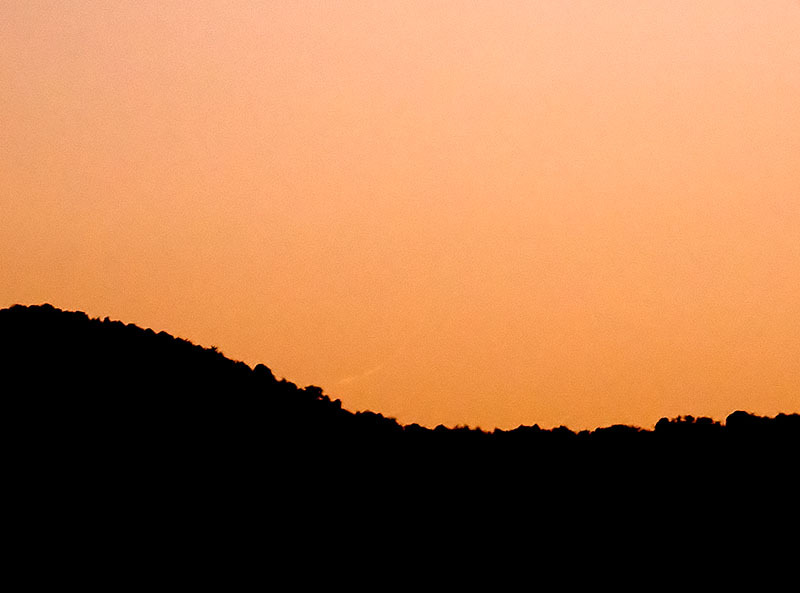 I caught this visually from the Davis Mountains at 8:52 in 15x70 binocs hand-held. If my math was right the moon was 19 hrs 38 minutes old at 8:52 p.m. central. It's 0.79% illuminated per TheSky X. 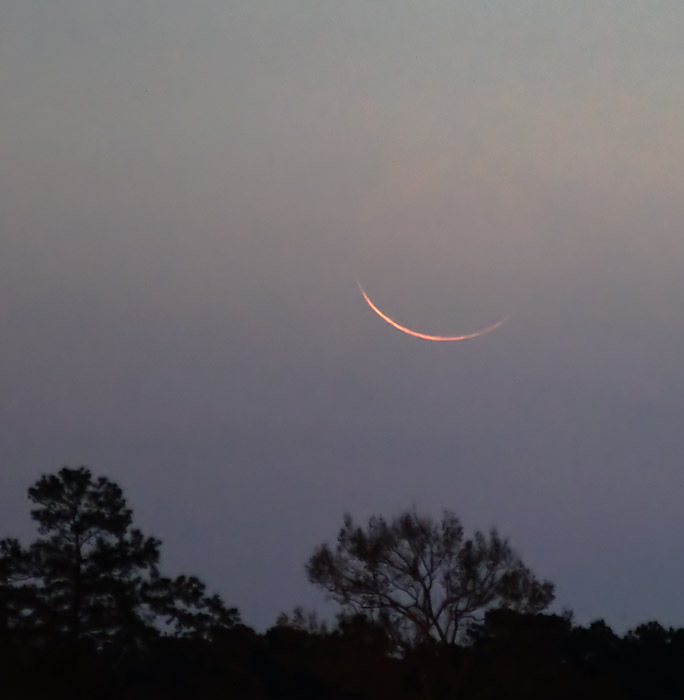 This is the youngest moon yet, eclipsing my old record (see next picture below) by more than 90 minutes hours. Nikon D610 camera, Nikon VR 300mm f2.8G lens at f3.2, 1/640s, ISO 1250, auto-exposed with the camera's spot metering option. More astronomy pictures from this trip are here. Getting the shot: A lot of planning went into this one. I checked the exact location of the the sunset the night before the thin moon to get an exact bearing. I had used the setting sun as a guidepost and knew exactly where to look which helped immeasurably. I set up on a high deck at my hosts' place to get above a mountain range this is about 3.5 degrees above the true horizon. The image above *was* the "youngest" moon I was able to capture prior to the top image on this page from 2014. The image immediately above is from May 19th, 2004 in the Davis Mountains. See details below. 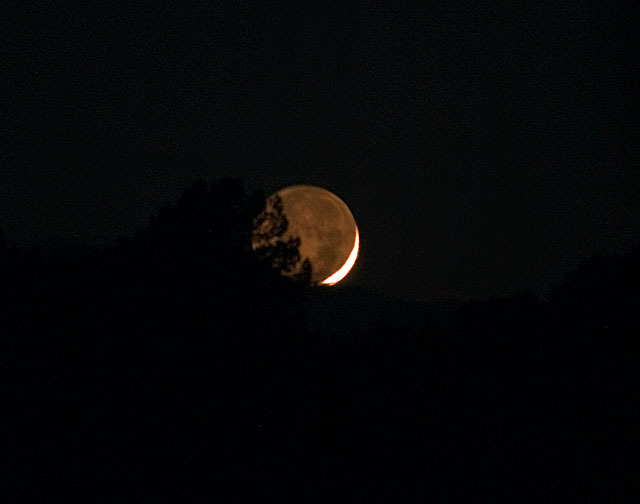 This was my first shot after sighting the moon at 5:55 a.m. 7/31/2008. Photo Details: 1.3 second exposure, Nikon D200, Nikon 80-200 f2.8 ED AF lens at 2.8, ISO 800 setting, significantly cropped from original. Moon was 1.34% illuminated, 2 deg 17 min up according to The Sky. 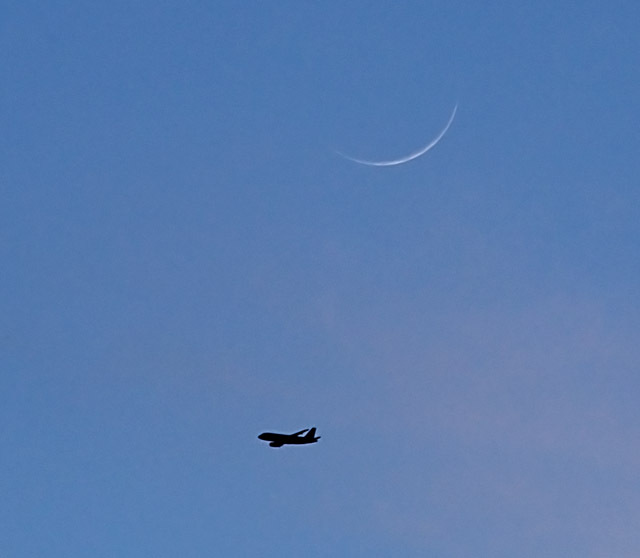 I have the new moon at 5:13 local time the next day, so that would be 23 hours 12 minutes from new. My last shot before heading into work was 15 minutes later, 22h 57m from new. See picture below. 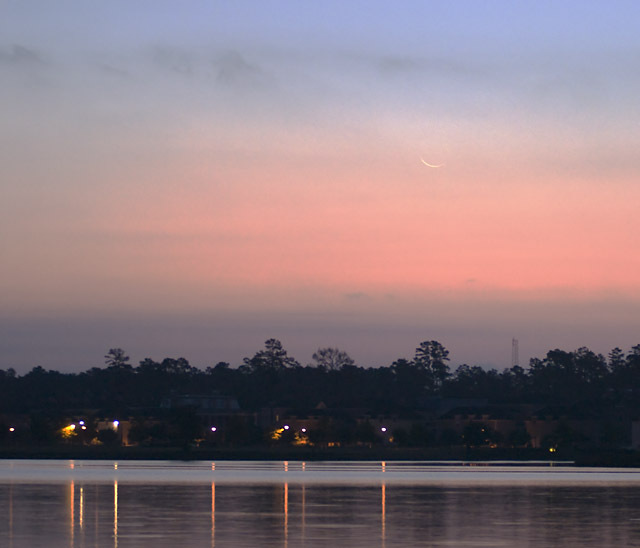 Here's the report I sent to the local astronomy clubs: I was able to catch this morning's thin crescent moon from the south shore of Lake Woodlands. Aside from the annoying lights nearby, that turned out to be an excellent location due to its very low ENE horizon. First view was at 5:55 a.m., which I think means it was about (23 hours 12 minutes, corrected) from new. I took a series of images over the next 15 minutes. This was pretty easy in my 8x42 binoculars once I located it, and I could see it in the camera viewfinder (using 80-200mm f2.8 lens at 200mm) after 6:00 a.m., but I don't believe I saw it naked eye. Above: 1/8 second with same equipment noted above at 80mm, moon 22h 57m from new. It was the last shot I took before heading to work. Picture was manipulated in Photoshop to increase contrast; the moon was much more difficult to see than the picture implies. Trick: Focus is critical on these pictures, and it's often dark when you're shooting. 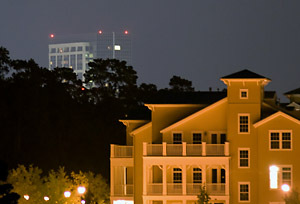 On the 23 hour moon shot above I focused on the distant Anadarko Building. 2/21/04, 6:17 p.m. Moon above is almost exactly 39 hours old by my calculations. Processed with Neat Image to remove noise & sharpen. 1/160 second, Nikon D100 at ISO 400 setting, Nikon 300mm f2.8 lens at f2.8. Moon & Planetary Landscapes My main index to thin moon images is here! 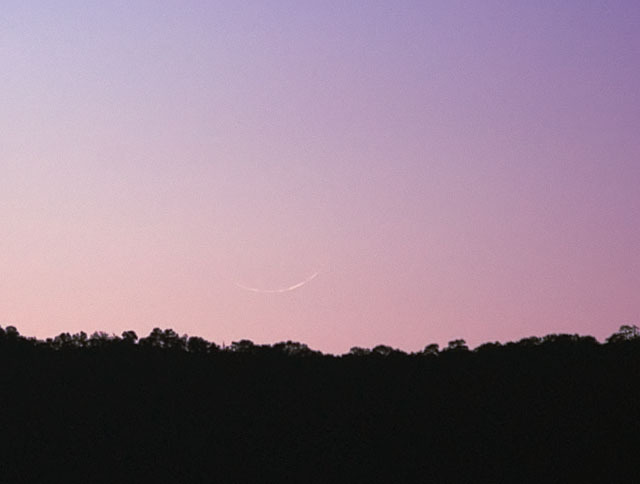 I was able to view a thin crescent moon in the Davis Mtns. I drove around at sunset trying to find a place with the lowest western horizon. I set up my camera/lens/tripod on a road, and scanned for the moon in 10x50 binocs. Acquired it at ~9:08 p.m. CTD, age 21 hrs 15 minutes -- and started taking pictures. Right as it was setting into the trees a car came along and I had to move. I only had it for a few minutes, and I don't believe I saw it naked eye. Hard to remember in all the excitement... The Sky says its phase was 0.75%. When I got back to the cabin (*after a long walk and a ride back to my Van, whose battery I had drained) I loaded the pix onto my laptop. I about had a heart attack when I couldn't see the moon at all in the thumbnails and the first full-sized images I looked at. On closer examination, thankfully, the moon is indeed visible on a number of the images - just barely! Photo notes: Nikon D100, Nikon 300mm f2.8 lens, 1/60s, time 21:09:30 CDT. *See below for the dead battery story... Sky and Telescope has an even younger picture here. May 20, 2004 (Next Night). Had to dodge Lightning that night! start on the evening's shooting.